NEXT.exchange: Explaining the Difference Between ICO’s, IEO’s, and STO’s. Launching the Blockchain of NEXT (currently in Testnet) is not for the sole purpose of detaching from the Ethereum network to achieve greater scalability for NEXT.exchange, but rather to create an entirely decentralized ecosystem. Our chain will become the backbone of NEXT.exchange and will provide for massive transaction capacity on the platform, enabling stunning volumes, instant and transparent transactions, and quite relevant to the title of this post: Asset Deployments. Going into Mainnet — users will be able to issue digital assets on top of our Blockchain by using NEXT. These assets can then be traded directly on NEXT.exchange. But, launching an asset will not be available to everyone. We do not want our network to be flooded with low quality assets with an uncertain future. More details to come in a later post. Assets can be hosted on NEXT.chain in a similar way to how ERC20 assets are hosted on the Ethereum Blockchain. Essentially, this allows us to host Initial Exchange Offerings (IEO’s) on NEXT.exchange, as well as Security Token Offerings (STO’s). While most market participants are aware of Initial Coin Offerings that meteored in popularity over 2017 and 2018, IEO’s and STO’s may come off as a new practice. 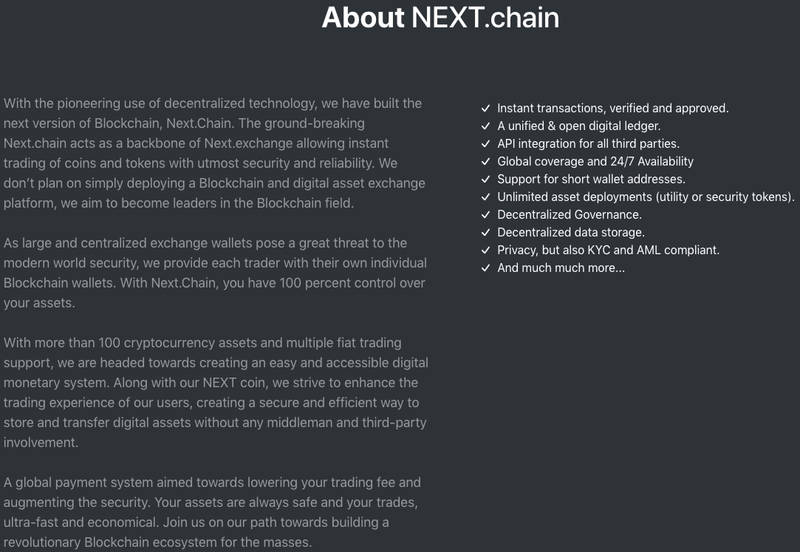 Let’s dive into what each one means as well as how NEXT.chain and NEXT.exchange come into play. The ICO hype of 2017 and 2018 was jaw-dropping. Never before had the world seen crowdfunding of this size! An estimated 3.5 billion USD was raised in 2017 alone. Offerings would sell out in minutes, leaving many with slim chances of joining crowd sales, and creating serious buy pressure in the open market. An ICO usually has a soft cap and hard cap, a minimum, and maximum which can be raised during an ICO. In return, an investor receives tokens which are later tradable on the open market. Tokens offered during the crowd-sale should ideally have a function in the product which is being created by the team behind the ICO. Crowdfunding through the use of Blockchain technology enables for such campaigns to be held on a global scale, granting virtually anyone participation rights. And of course, a much bigger crowd means more opportunities to reach the established hard cap. This sounds like a fin-tech startup paradise, and surely it was. But not everybody was lucky to have made a successful investment. Sadly enough, ICO’s quickly became the synonym for a scam in the cryptocurrency space. According to research by Satis Group, 81% of ICO’s would never list on an exchange, leaving investors with empty pockets. Scams were so widespread that the United States Securities and Exchange Commission was forced to crack down on the practice. HoweyCoins.com, was launched by United States authorities with the purpose to make investors more cautious of their investments. The painful reality of ICOs. In 2018, the SEC pounced on one ICO after the other. Regulations are steadily creeping into the digital asset environment. ICOs had a good run, but launching an ICO today is risky, the SEC is chasing ICOs held in the past and investor trust in the practice has been largely eroded. There is minimal accountability involved with ICO’s. The digital asset market experienced a very strong downtrend during the second half of 2018 and early 2019. Many ICO treasuries got cut down. Despite the space being quite rocky in 2018, doubtable projects were still popping up . In search of a more secure alternative for Blockchain based crowdfunding, the concept of IEO’s came to light. Instead of participating by sending funds to a smart contract address, digital asset investors register on an exchange (expanding the platforms user base) and then buying into the offering. The exchange platform hosting the IEO would then list and make available for trading the newly created digital asset. After an IEO, not only are investors confident that there will be a market to trade their newly received assets, but also that they invested in a project with increased credibility and backing. The due diligence performed by the exchange prior to hosting the IEO provides for a greater sense of overall accountability. Additionally, the project team involved in the IEO is exposed to the exchange platforms user base, providing both businesses with added exposure. Launching an STO is a more complicated process compared to that of an ICO and started gaining traction towards late 2018. STO’s are compliant with security laws. Tokens issued during the process of an STO are securities. A security token can be anything, tokenized bonds, equity (see Equity Token Offerings or ETOs), even tangibles such as gold, diamonds, and paintings can be tokenized and become digital securities. Through an STO, Investors can receive actual ownership in the company behind the offering, including voting and dividend rights. Another beautiful thing about digital equities is that a transfer from one person to the other is incredibly easy and cheap. Because regulations differ from country to country, an organization must fully comprehend which regional laws they have to obey before issuing a digital asset via an STO. This takes time and effort but puts a team on the right side of regulations while creating greater trust and security for investors. STO’s are still very young but can provide many advantages for investors. A Reverse Dutch Auction can create a certain price even before the launch of the digital asset and be a guaranteed profitable investment (if we are to run an STO, it will be as a Dutch Auction system). On the other hand, a company can have on-chain assets next to digital assets, which would create an even more illiquid market as is often seen with young assets. This could create unwanted price volatility. Several platforms that cater to STO’s have been launched in the past months, a few of the most well-known ones being Polymath, Swarm, and Own. The future of STO’s is still very uncertain and will have to keep evolving together with the regulations of tomorrow. The NEXT Ecosystem and our stance on IEO’s and STO’s. The NEXT ecosystem is on a path towards full regulatory compliance. Appropriate license acquisitions are being worked on by our legal team. The list of regulations is long, but slowly we are ticking the boxes. We want to ensure that we have everything in place legally to fully embrace the future of Blockchain based crowdfunding while providing our users with maximum security and trust. On NEXT.chain, digital assets can be launched with relative ease. Similar to the way in which the Ethereum Blockchain was used to issue ERC20 assets and consequentially, ICO campaigns. Going forward, and as we become more regulatory sound, it is not beyond the realm of possibility for our trading platform to cater to Security Token Offerings (launching STO campaigns and trading securities). In fact, we are very much so looking forward to entering this environment and see it as an incredible opportunity for NEXT as an exchange, for organizations that wish to tokenize their assets, and our growing user base. Currently, our platform is registered as a B.V in the Netherlands and as an LTD in England and Wales. We are currently in the process of obtaining an EMI and establishing a trust to handle in and outbound fiat operations. Launching IEO’s on top of NEXT.chain and NEXT.exchange will be quite simple in the near future thanks to the functionality of our Blockchain. While catering to STO’s will require a significant amount of legal work. Which we are currently undertaking and will ramp up efforts in this regard post the 1.1 update of our platform and Mainnet. The future of our company is looking quite bright, and through our developments, we hope to aid in the creation of a more mature digital asset environment that is not shy of smart regulations and one that is flexible and constantly evolving. We hope to see you taking part in future IEO’s and STO’s that we will launch within the NEXT ecosystem. Dutch based hybrid cryptocurrency exchange platform.